Description: NS 6779 leads a train through Mapleton. 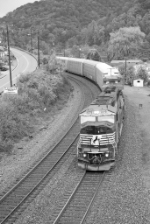 Description: NS SD60M 6779 with a white number patch in Columbus, Ga. 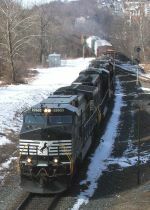 Description: The Norfolk Southern unit at left is on main 2. There is five miles of double track through Portage. Description: Yet another westbound intermodal, only 10 minutes after the last one, blasts past this one with a former Conrail SD60I on the point. Description: This ex-CR NS Unit shows its obvious "Big Blue" heritage while assigned to UP Train MNLAS 18 as the second unit. Description: Close to midnight, UP Train ASHAS 18 slowly heads up the main past tied down UP Train MNLAS 18 in Junland Siding with NS Power. The reflection is courtesy of 13 inches of rain in about 18 hours. I don't think anybody has ever seen the ditch that high. Homes across the road were flooded out that had never been flooded out. Thanks to IKE for removing a "speck". Description: Tied down in Junland Siding was UP Train MNLAS 18 with the power shining in the setting sun. Description: First westbound showed up right as we got up on the deck. Description: Eastbound on track one with a CR lashup as he enters the yard at CP Mary.